By Chris Williams on September 20, 2013. I sprayed an insecticide on several hydrangea bushes to kill aphids. The next day, most of the leaves had turned yellow and were starting to drop off. I’m heartbroken that I might have killed my hydrangeas. What did I do wrong? What you experienced is what we call “phytotoxicity,” which is a fancy term for plant injury that is caused by chemicals. Misuse of insecticides, fertilizers, and other chemicals can “burn” a plant’s foliage, affect growth, and may even kill the plant. I don’t know what you sprayed, or how much, but the most important thing is to make sure that the product you use is labeled for that use on that plant. It’s very important to read the label. Some plants are more sensitive to a particular insecticide. Even if the product is labeled for use on or near plants, there may be certain plants listed on the label that cannot tolerate the product. Typical label warning: Do not use on Boston ivy, Virginia creeper, or maidenhair fern. 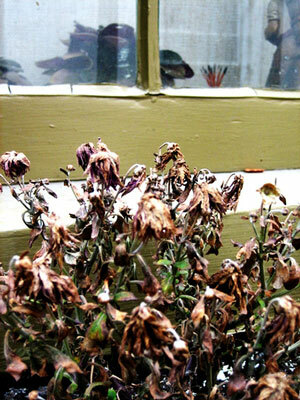 Overapplication is another cause of plant damage. Even though a product is considered safe to apply to a particular plant, application at a higher rate than the label recommends can burn the plant. People often mistakenly think that if a little of the insecticide works, more will work even better. Another reason for plant damage is retreating the same plants too often. Each application to the plant may be at the label rate, but if too many repeat applications are made too soon, injury can result from insecticide buildup. A typical label warning is: Spray no more than four times during the growing season; two week minimum application interval. The condition of the plant can be a factor. Plants that are stressed or in poor health are more susceptible to chemical damage. Seedlings, fast-growing succulent plants, and plants with a large amount of new growth are also at higher risk. Typical label warning: Do not apply to evergreens when tender new foliage is present. The weather at the time of your application can be a factor, too. Some insecticides are safer for plants when applied in cool weather while others should be applied in warm weather. High humidity or wet leaves can increase the risk that insecticides will burn foliage. Plants that are water-stressed are more sensitive to spray applications. The bottom line is always read the label completely before pesticide application. The label should tell you everything you need to know to avoid harming your plants. Hopefully, because it’s late in the season, your hydrangeas will rest and recover over the winter and will leaf out just fine next spring.